The ACT is given six times per year (September, October, December, February, April & June). 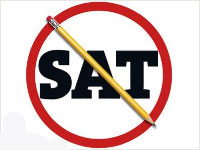 About 1.92 million students from the class of 2015 (59%) took the ACT compared to the 1.67 million who took the SAT. The test is made up of four required sections (English, Math, Reading, Science) with an optional essay. Each section on the ACT is graded on a scale of 1-36. The four sub-scores from English, Math, Reading and Science are averaged to get the student’s Composite score. The optional essay is scored on a 2-12 scale and not included in the average for the Composite score. English: 75 questions in 45 minutes, focusing on grammar rules and context. Math: 60 questions in 60 minutes, emphasizing Algebra 1, Algebra 2, Geometry and Trigonometry. Reading: 40 questions in 35 minutes based on four total passages with one from each of four categories: Fiction, Social Science, Humanities and Natural Science. Science: 40 questions in 35 minutes, testing a student’s ability to quickly assess the results of 6-7 experiments, mostly through recognizing patterns in tables, charts and graphs. No science knowledge required! It is recommended that students take the optional essay section. It is a 40-minute exercise, where the student is presented with an issue and three viewpoints on that issue. The student must assess each viewpoint and give his or her own assessment of the issue.